A CBA is a structured methodology for improving the quality of comprehensive PreK-12 school counseling programs and counselor practice. The CBA is not intended to replace your current counseling program but to provide strategies and tools to enhance it in ways that support students achieving at higher levels and fully benefiting from their learning experiences. This overview describes the essential features and components of a CBA and the results you can expect to achieve by using the tools and completing the tasks associated with each component. The overview incorporates both narrative and graphics to describe the CBA. A MS PowerPoint presentation is also provided that contains just the graphics in case you want to use it to inform your colleagues about a CBA’s functions and benefits. The narrative can provide the information you need to communicate the meaning of each slide to others. The CBA was developed in response to some fundamental changes that need to occur in PreK-12 school counseling programs. Two defining characteristics of a legitimate educational program are that the program is research-based and evidence-based. This means that the program is supported by what research has determined to have a strong link to student achievement and well-being. It also means that strategies and practices used to deliver the program are substantiated by compelling evidence. The CBA was developed as an effort to establish a stronger connection between school counseling programs, student outcomes, counselor practice and research. This involved using research findings as primary filters for the design, delivery and evaluation of comprehensive school counseling programs. Much more work needs to be done to ensure a strong and dynamic connection between what research has determined works and counselor practice. It is important to begin with a clear understanding of the unique role of school counselors and how the school counseling curriculum enables counselors to fulfill their role. Different types of educators make different types of contributions to students’ ability to achieve and succeed. While all good educators are invested in the holistic development of students, each attends to different facets of the educational experience which, when coordinated well, catalyze maximal learning and development. Classroom teachers, for example, attend more to the obvious, observable and measureable aspects of achievement. They focus on the facts, concepts and processes that reflect mastery of a particular area of knowledge and enact effective instructional techniques that maximize students’ opportunities to acquire knowledge and expertise. In contrast, counselors help students develop the knowledge, skills, attitudes, beliefs and habits of mind that enable them to profit maximally from their instructional opportunities and experiences. Whereas teachers are primarily concerned with students’ cognitive development, school counselors are primarily concerned with students’ metacognitive and social-emotional development. It is a foundational assumption of a CBA that school counseling programs are equal in importance to content area programs (e.g., math, ELA). This is because counseling programs, like content area programs, have knowledge to be acquired and skills to be developed that are necessary for student success in school, work and life. 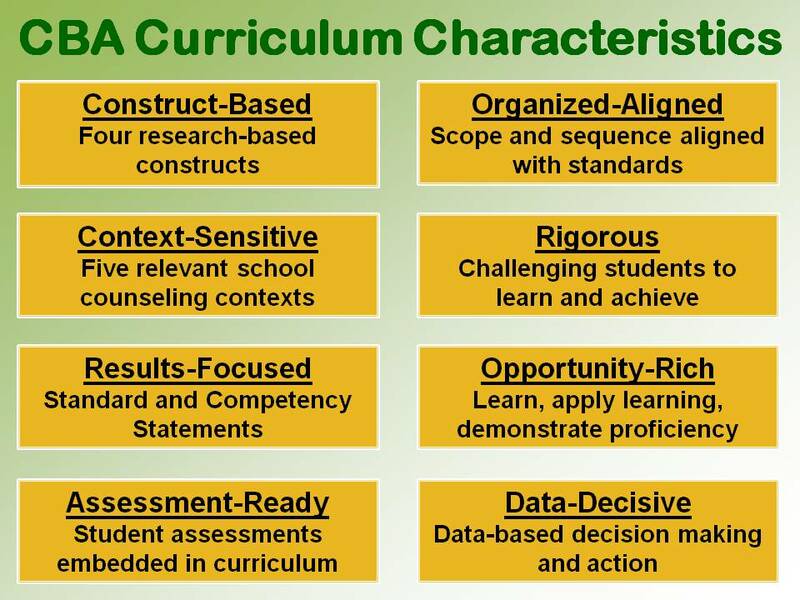 These knowledge and skill requirements constitute the “content” which a school counseling program delivers to students. Standards of excellence related to this content are articulated as standards and competencies students are expected to achieve. School counseling programs, like content area programs, are standards-based. School counseling programs also use a curriculum organized in a developmentally-appropriate scope and sequence to deliver the content and assess student progress, proficiency and achievement in relation to the standards. Data and data-based decision making are used to collect, analyze and report meaningful information that leads to informed educational decisions. In addition to these shared attributes of school counseling and content area programs, school counselors also focus on helping students develop the attitudes, behaviors and habits of mind that lead to success. The school counseling curriculum is the primary vehicle for delivering a CBA. A great emphasis needs to be placed on developing and delivering a challenging school counseling curriculum to deliver relevant content required for students’ metacognitive and social-emotional development. Rather than being ancillary to school counseling programs, it should be recognized as one of its core components. The effective use of data and data-based decision making are also defining characteristics of a high quality educational program. Data collection, analysis and reporting can be a daunting task requiring a great deal of time and effort. It is critical, therefore, that school counselors carefully identify the types of data to gather which yield the most impactful results and develop efficient processes to gather, manage and report the data. A systematic school counseling data management system is needed to effectively use data to determine progress and achievement in terms of student achievement and program delivery. A CBA relies on strategies and practices that have been substantiated by data. 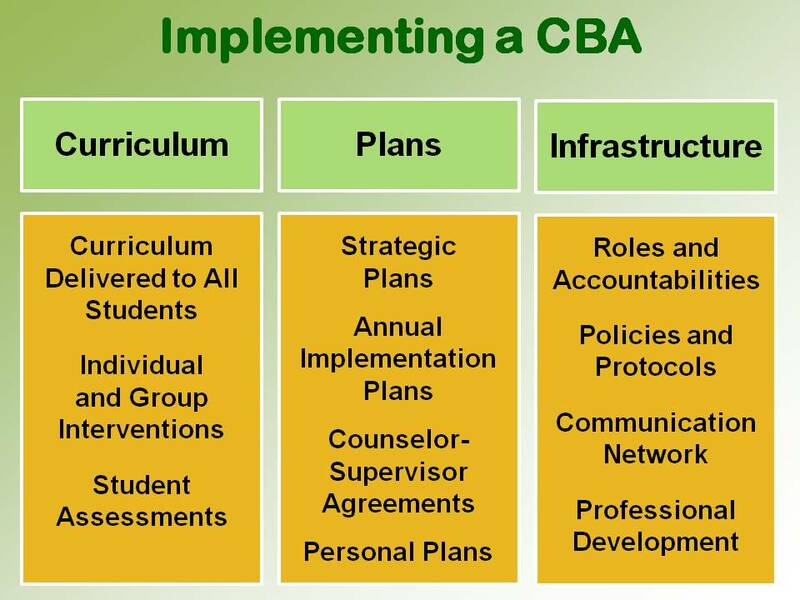 A CBA uses data-based decision making to establish student needs, determine appropriate strategies/interventions and evaluate the impact of delivering the interventions. Evidence-based practices reflect well-designed and effectively delivered programs that consistently produce desired results. Data are required to understand and effectively address students’ learning needs and provide valuable information to help students increase their capacity to learn and improve their learning outcomes. Data are critical to the successful implementation of a CBA and in determining student progress toward and achievement of the CBA student standards. 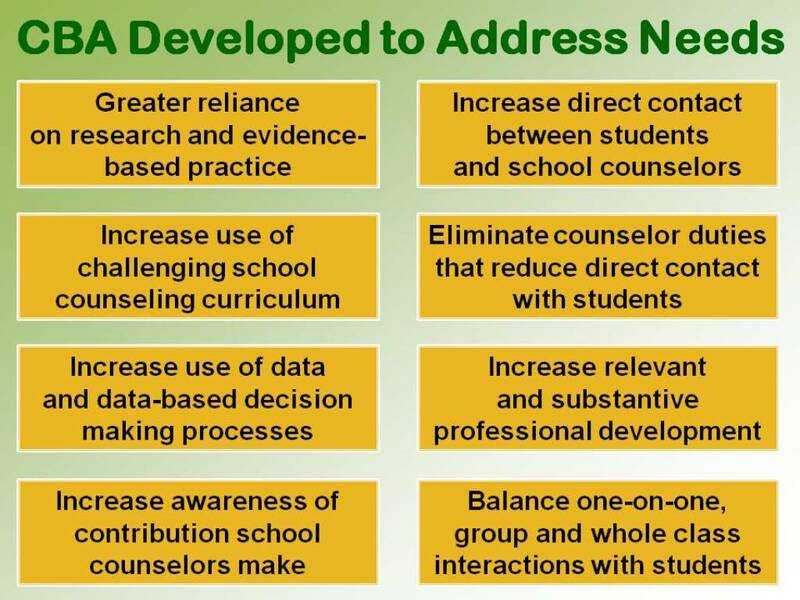 Data are also needed to promote the significant contribution of school counselors to student achievement and the quality of the school community. Unfortunately, too few people have a clear understanding of what school counselors do or the significant contribution school counselors make to student learning and the quality of the school community. This condition does not seem to improve over time. It is important for school counseling programs to be recognized as comparable to and as valuable as content area courses. Research is beginning to demonstrate the efficacy and value of school counseling programs, especially as they relate to students’ metacognitive and social-emotional development. There is a deep need for school counselors to promote their program at the local level. Compelling data demonstrating how school counselors are being accountable and helping students learn and achieve are an important part of this process. If school counselors do not take it upon themselves to promote and advocate for their program and the school counseling profession, no one else is going to do it for them. Accountability reports are needed to demonstrate the positive impact school counselors are having on student success. School counselors are trained to guide students through critical developmental stages in their learning and lives. The design of the school counseling program needs to incorporate a significant amount of direct interaction between students and counselors in a variety of contexts (e.g., whole class, group, responsive services). It is the personalized approach wherein the most significant interactions occur. Counselors need to interact with students face to face, not from a distance. The school counseling curriculum can and should be an important component of the direct contact approach. Consideration should be given to the student-to-counselor ratio in schools to reflect the amount of time required to effectively address students’ academic support and social-emotional needs. Part of the problem counselors encounter is that they are often assigned non-counseling responsibilities or responsibilities that have a low impact on students’ thinking, behavior and well-being. It must be asked whether students are being served at the level they need by having counselors working on these types of assignments. Helping students cope with the many challenges of learning and growing up is a major function of school counselors. To what extent are we disadvantaging students when counselors do not have the time to meet with them and help them resolve their problems? It is important for counselors to look at the distribution of their time, what they are being asked to do, and how that impacts their ability to work with students. School counselors are a valuable resource, a resource that should not be wasted when they can be helping students become more proficient learners and helping them in significant ways to improve their learning processes and outcomes. Meaningful and substantive professional development opportunities are required for highly-qualified professional school counselors. One only needs to look at the expanding body of knowledge about student learning based on studies about metacognition, social-emotional learning, executive functions and brain research to realize that ongoing professional development is needed for counselors to keep up with new ideas and trends. The amount of targeted professional development counselors get should be increased, along with dialogic interaction among counselors, other support personnel and teachers regarding how to utilize new information that can help them improve their service to students. School counselor performance evaluations can also contribute to counselors’ professional development by focusing on insightful feedback and learning opportunities to counselors in ways that actually help them improve their practice. School counseling programs are for every child. They differ from other support personnel professionals (e.g., social workers, school psychologists) who see only some students. School counselors, primarily through the counseling curriculum, can deliver critical content to all students. It is important to reframe the reliance on one-on-one student-counselor interactions to ensure a balanced approach to serving students through a combination of whole grade, whole class, group and one-on-one interactions. This is required to ensure that school counseling programs succeed as an every child initiative. 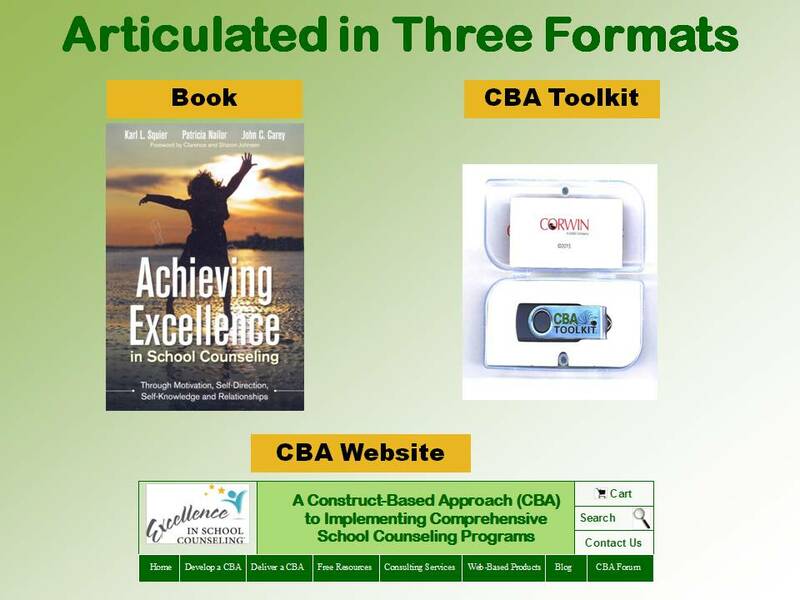 A CBA is articulated in three formats: a Book, a Toolkit, and a Website. The Book and Toolkit are published by Corwin. The CBA Website is published by the authors. Click HERE for information on ordering the Book and/or CBA Toolkit. 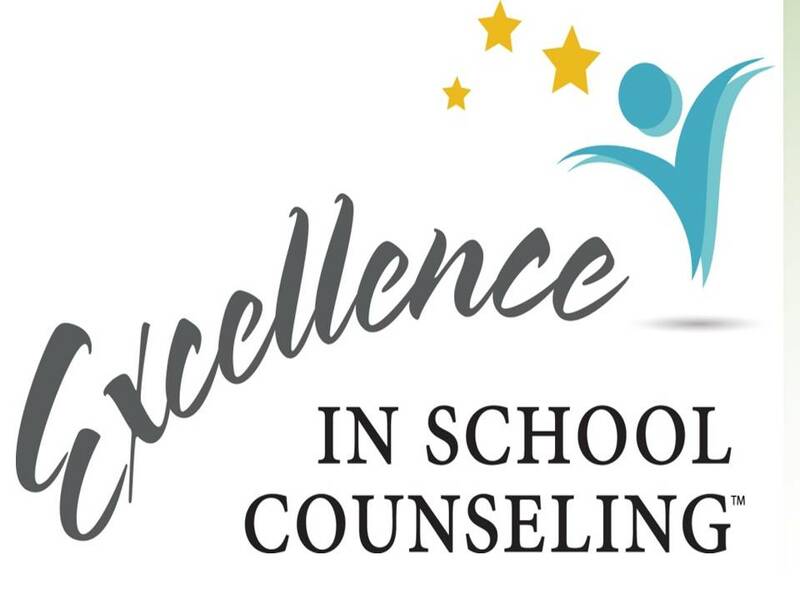 The CBA Website’s URL is www.excellenceinschoolcounseling.com. Updates and new information and tools will be posted on the CBA Website monthly. 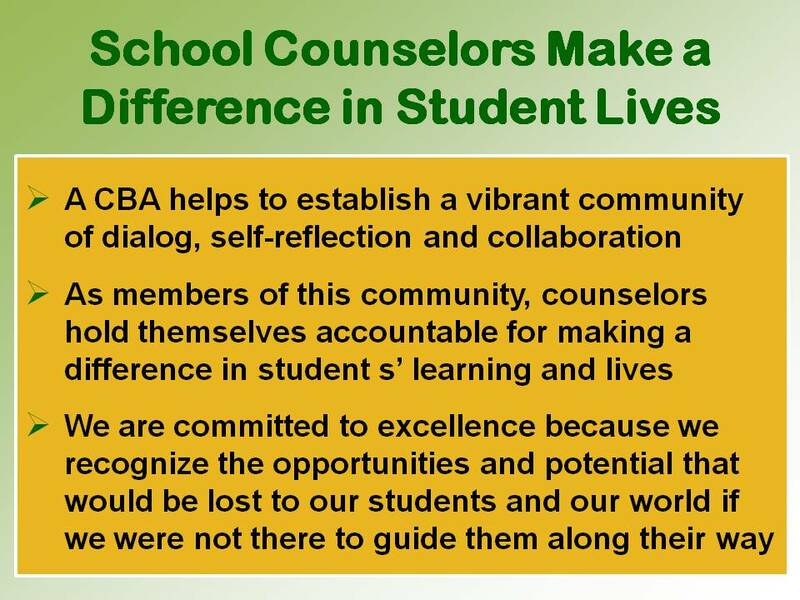 The CBA is a pathway to excellence in school counseling programs and counselor practice. 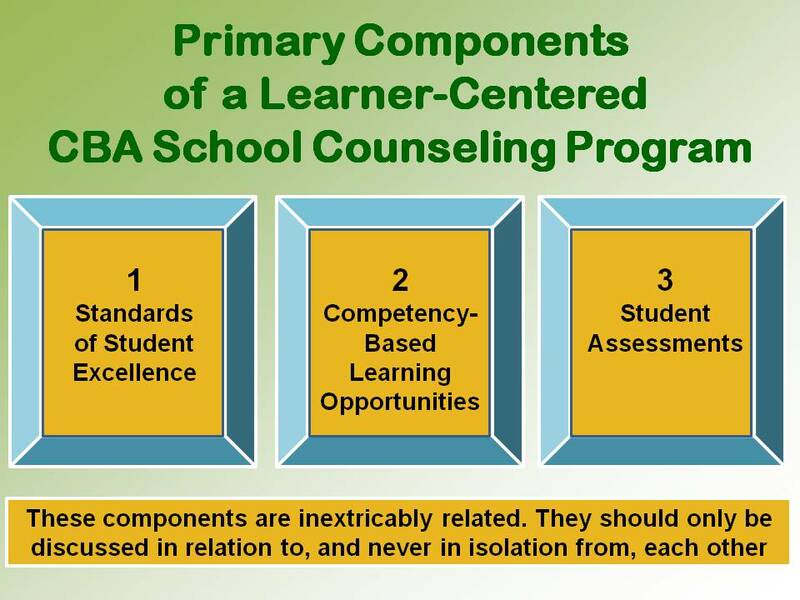 In order to fully grasp the essential character of a CBA it is important to understand three critical attributes of a CBA school counseling program: learner-centered, research-based and results-based. Each is discussed briefly below. The information and tools in our Book, Toolkit and Website all use these attributes as primary filters to help you develop, deliver and evaluate a CBA, and integrate it into your current school counseling program. The primary focus of a CBA is student achievement and well-being. The graphic below identifies three aspects of this focus. School counselors are, as part of their fundamental mission, responsible for supporting students’ learning, development and academic achievement. By contributing to students’ sense of well-being and helping them resolve challenges to their learning and social-emotional maturity, school counselors guide the process resulting in students becoming proficient learners capable of achieving at their highest potential and benefiting maximally from their learning experiences. By focusing on students’ metacognitive and social-emotional needs, school counselors help students learn how to learn, plan for their future success and cope with the myriad challenges of learning and growing up and being prepared to enter into and succeed in the educational and career opportunities available to them once they graduate from high school. School counselors provide substantive support all along the PreK-12 learning continuum in terms of helping students be successful in each school year. They also are significant contributors to students effectively making the transition between levels and also the transition from high school into the postsecondary world. 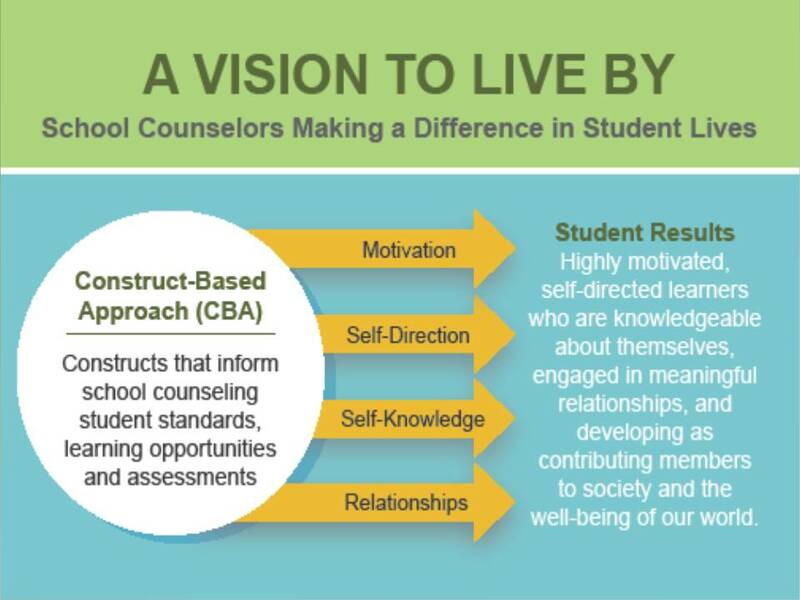 Student success and well-being are the primary foci of a CBA school counseling program. All other activities and responsibilities associated with a CBA are performed in support of student success and well-being. A CBA reflects student abilities, competencies, capabilities and skills that have been established by research in educational, developmental and social psychology to be strongly related to students’ academic achievement and success in later life, and are acquired or perfected through experience and learning. 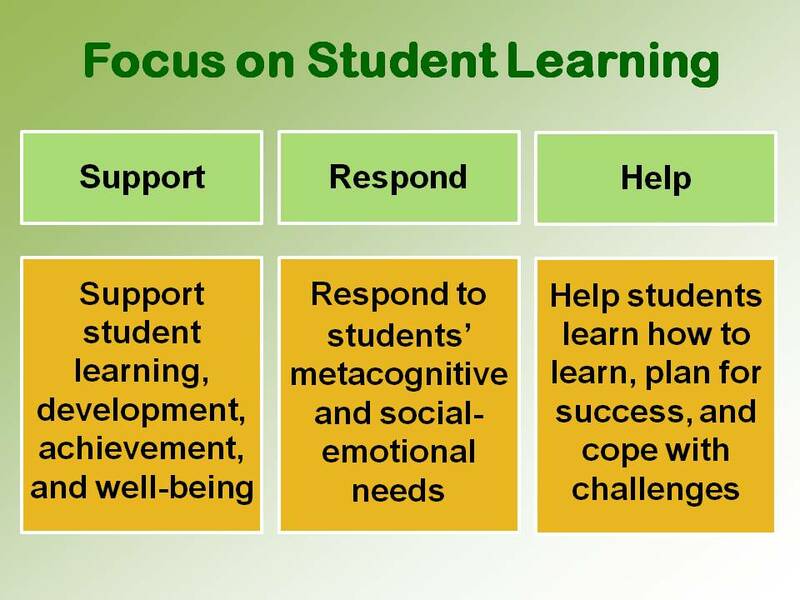 Lines of research were followed that connected to student competencies within the purview of counseling practice (academic, personal, social-emotional, career). Research has established that school counseling programs are substantive contributors to student success by supporting academic achievement, personal and social-emotional skill development, and preparing students to succeed in the postsecondary world. A review of more than 50 years of research yielded four constructs and associated sub-constructs that have a positive impact on student learning and learner outcomes. The constructs and sub-constructs are displayed in the graphic below. These constructs and sub-constructs are used as primary filters for developing, delivering and evaluating a CBA school counseling program. A major premise of a CBA is that if research has established that these four constructs have a substantive impact on student learning, and since they are within the purview of school counselor practice, that it is reasonable to conclude that these constructs can be used as primary filters to design, deliver and evaluate comprehensive school counseling programs. These constructs and associated sub-constructs, in and of themselves, are only words that have little meaning outside of a “relevant context.” The notion of context describes a set of student-related processes or conditions in which all students participate and for which school counselors have a responsibility to help students successfully address. Five school counseling contexts have been selected as relevant to school counselors maximizing their potential for helping students succeed: a) academic support, b) student planning, c) college and career readiness, d) personal growth and e) social interaction. Each context contains essential processes in which students are expected to become proficient. 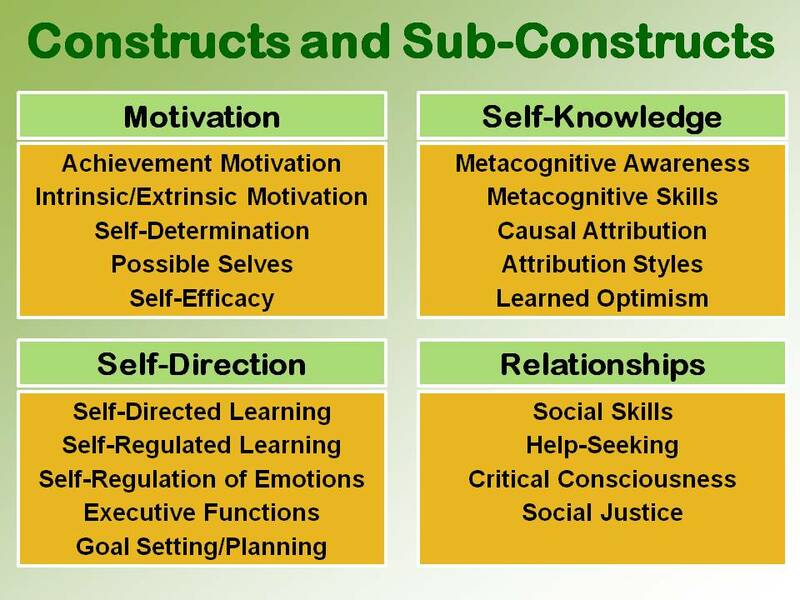 Asking what each construct and sub-construct means in terms of each context enables school counselors to focus on aspects of students’ learning that will make a significant difference in students’ learning and lives. These five relevant school counseling contexts become a second set of filters that inform the development, delivery and evaluation of a CBA school counseling program. The foundation on which a CBA school counseling program is built is what research demonstrates works in terms of student achievement and well-being. It is important for school counselors to know about research results and use them to inform their practice. Under the “Develop a CBA” section of the website and under the “Define Student Excellence” sub-section is information under the title “A CBA is Research-Based.” In this section we have attempted to make the research on which the CBA is based meaningful to school counselor practitioners. A summary description is provided for each construct and all their associated sub-constructs, along with links to websites and online videos to further help you understand the concepts and applications that can be used as part of a CBA. The graphic below, which is described in more detail in the research section, is an example of how research results can be used in a CBA. A result is the outcome we expect to achieve. A CBA is results-based. 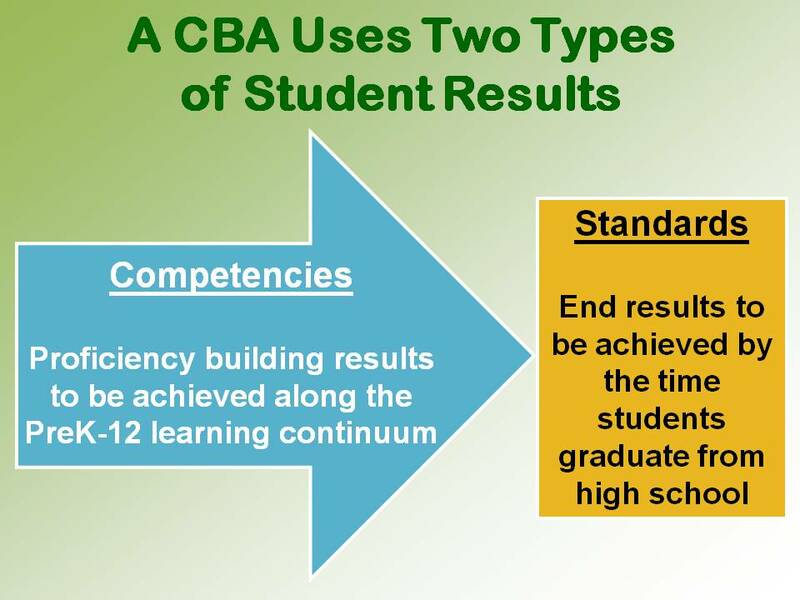 The outcomes that can be expected from delivering a CBA can be viewed from two perspectives: a) the broad components that comprise a CBA and b) student outcomes. 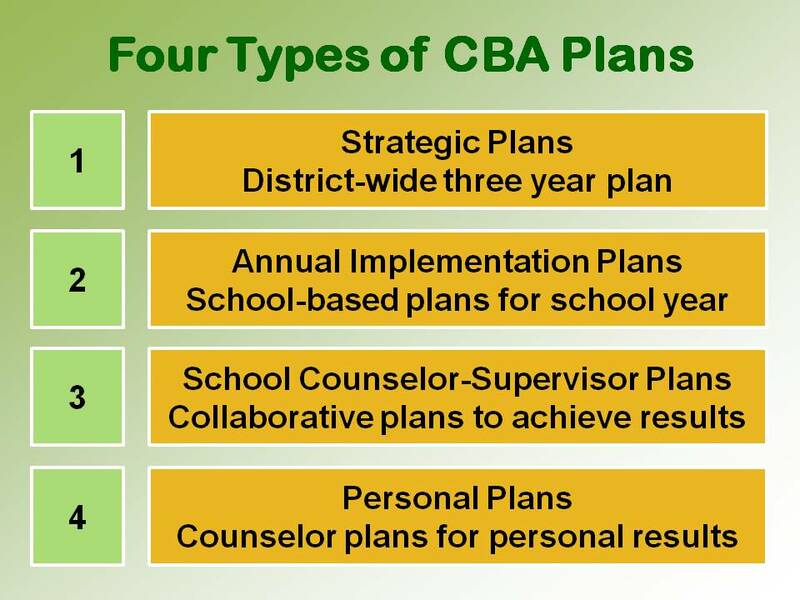 A CBA impacts four broad areas in a comprehensive school counseling program. Each area has specific results that are expected to be achieved through implementation of a CBA. The graphic below identifies the four areas. These four areas are all critical to the successful delivery of a CBA. The primary focus for this overview is going to be on student results and what a CBA requires to help student achieve the CBA school counseling student standards. The other three areas are addressed elsewhere in our Book and Toolkit, and on the Website. 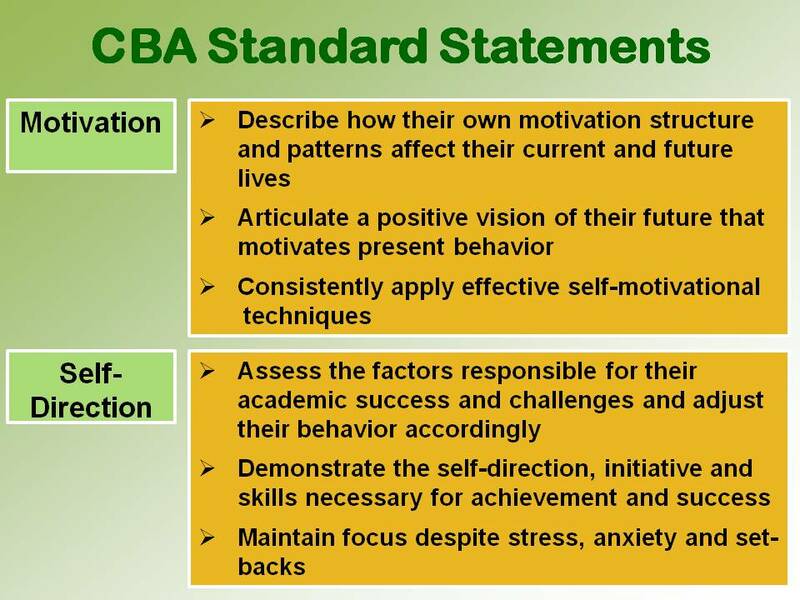 Standards students are expected to achieve through participation in a CBA school counseling program are articulated in terms of the four research-based constructs. The standard statements are displayed in the graphics below. A Construct-Based Approach (CBA) to school counseling is inspired by a vision of student excellence achieved through participation in comprehensive PreK-12 school counseling programs. 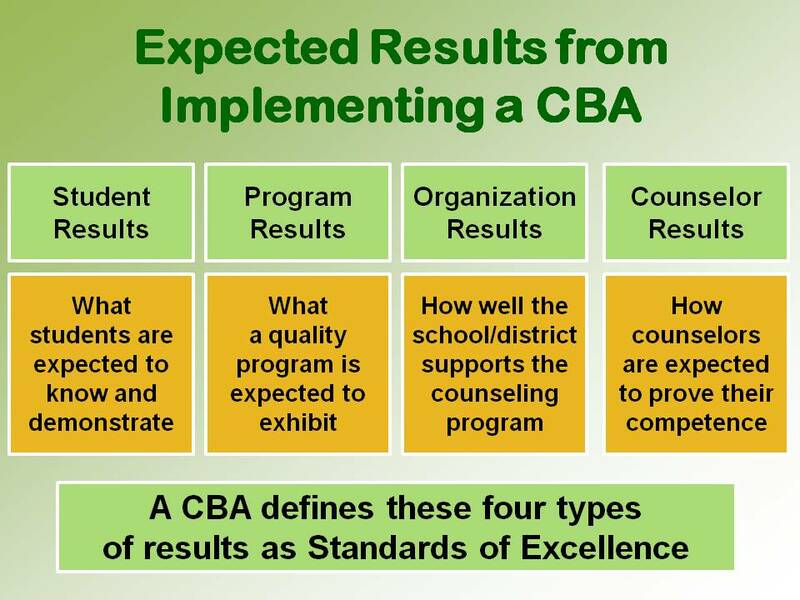 The CBA is results-based and is intended to improve both counselor practice and learner outcomes. Student results you can expect to achieve by implementing a CBA are displayed in the Vision Statement below. A central focus of a CBA is on measurable student results—what students are expected to know and demonstrate as a result of participating in the school counseling program. Results establish clear expectations for student achievement and success. Results focus on the acquisition of relevant knowledge, development of skills appropriate to educational and career pathways, and the attitudes, behaviors and habits of mind that lead to success. The results students are expected to achieve are articulated as standards and competencies. Constructs and contexts are primary filters used to define student results. Standards are “end results”—what students are expected to achieve by the time they graduate from high school. 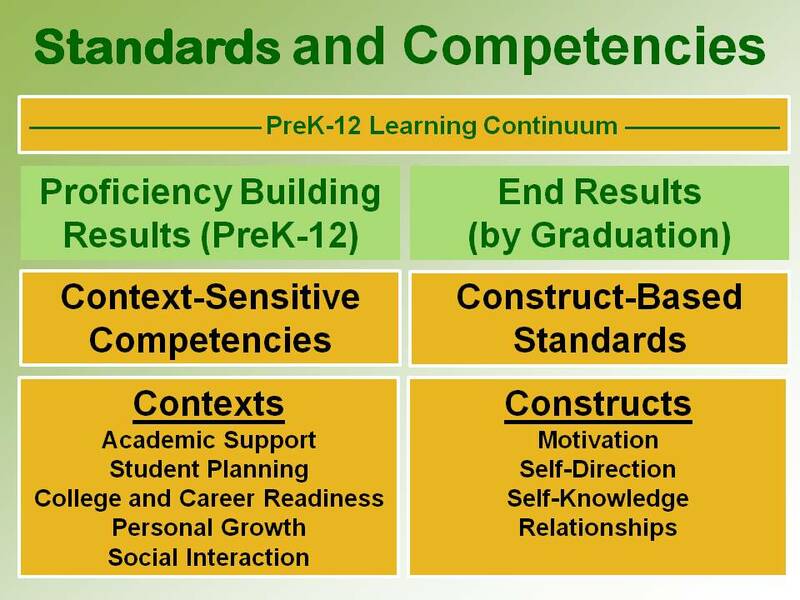 Competencies are “proficiency building results”—learning targets that students are expected to achieve along the PreK-12 learning continuum. Standards, as end-results, are developed in terms of the CBA’s four research-based constructs. Proficiency-building competency statements are developed in reference to the CBA’s five relevant school counseling contexts. These two sets of filters help define what students are expected to know and demonstrate as a result of participating in the school counseling program. 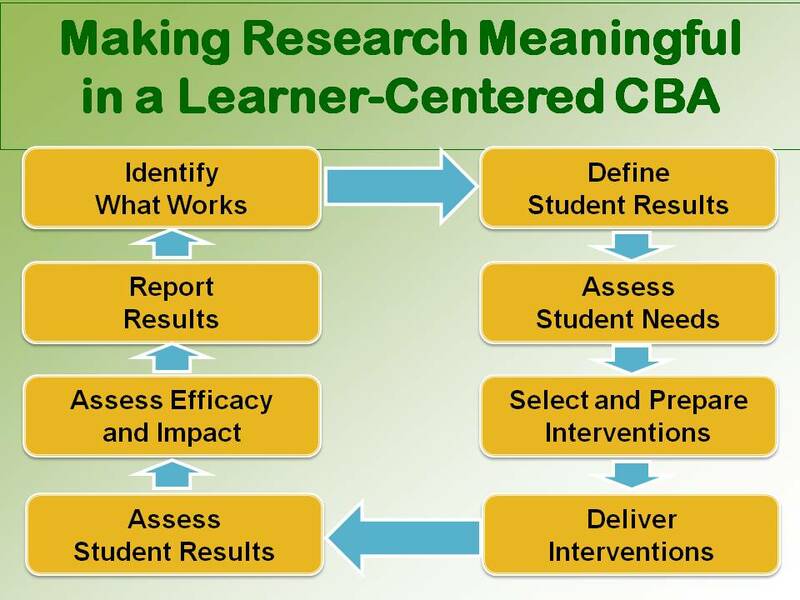 Now that we have identified the essential attributes of a CBA (learner-centered, research-based, results-based) it is time to discuss how you will construct your CBA. 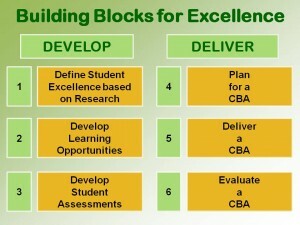 The foundation for a CBA is constructed using six building blocks. Chapters in the Book and Construction Sites in the Toolkit fully describe these building blocks. The Website provides updated and new information and tools to guide your efforts. 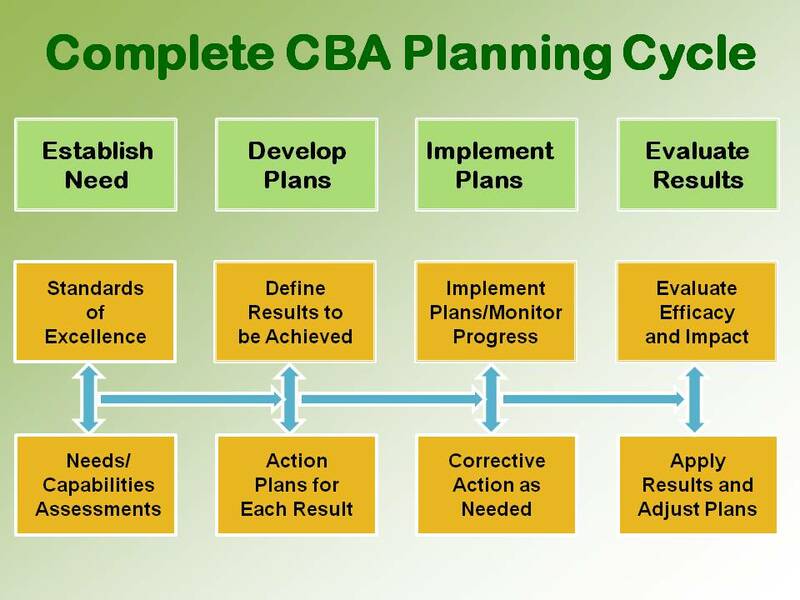 The “Develop a CBA” section of the Website focuses on the first three building blocks. The “Deliver a CBA” focuses on the last three. A CBA is a research-based program that focuses on a continuum of three areas required for counselors to help students achieve excellence. As noted above, a CBA is results-based. The results are articulated as standards and competencies that define the learning targets students are expected to achieve. Standard statements articulate end results to be achieved by the time a student graduates. Competency statements articulate proficiency building results to be achieved along the K-12 learning continuum. Competencies clarify the intent of the standards in measurable terms. They provide more precise examples of evidence and proficiency that can be used to determine student progress toward the CBA standards. CBA standards and competencies are used to develop a CBA curriculum. Competency statements become learning targets for the curriculum activities. The CBA curriculum is an integrated set of planned interventions that provide optimal learning opportunities for students. The curriculum is the primary vehicle for delivering a CBA. It is the only component of the school counseling program where all students can receive equal access to learning opportunities and where their progress can be uniformly assessed. Core curriculum activities, those activities intended for delivery to all students because of their importance in helping students achieve the CBA standards, focus primarily on motivation, self-direction, self-knowledge and relationships. Counseling curriculum activities, organized in a developmentally appropriate scope and sequence, are aligned with CBA standards and competency statements to ensure that students are provided with meaningful opportunities that maximize their learning potential. A CBA provides meaningful learning opportunities that enable students to learn what they are being taught, apply and transfer their learning in authentic contexts, and demonstrate their learning by demonstrating what they have learned to others. 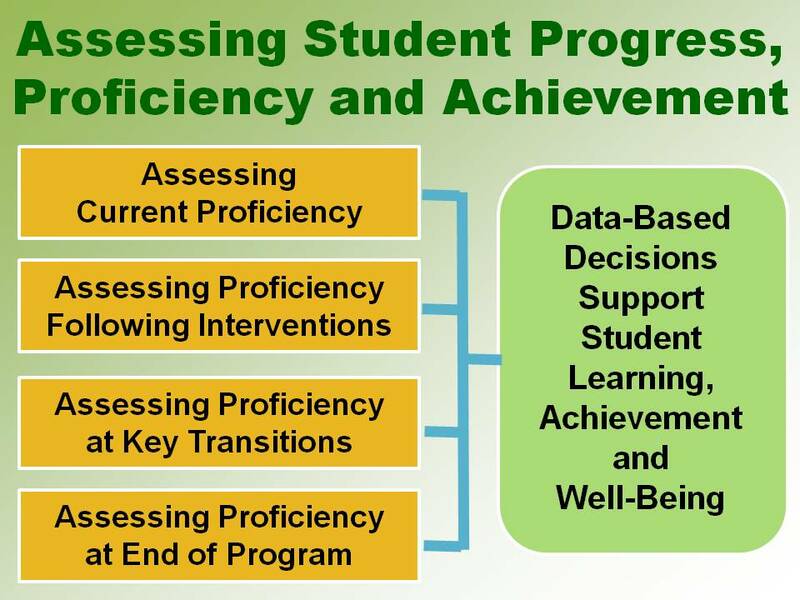 Standards and their related competency statements provide the learning student performance targets by which progress, proficiency and achievement can be determined. A CBA utilizes multiple ongoing assessments, including needs assessments and assessments embedded in each curriculum activity. Assessment results provide students, parents/guardians, school counselors and other educators with accurate and timely information on students’ progress, achievement and challenges. 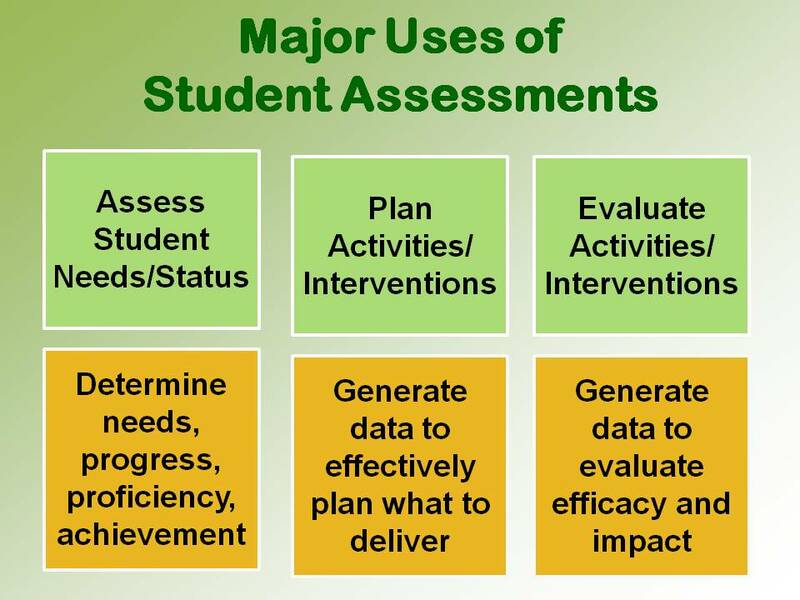 Student assessments have three major uses which are displayed in the graphic below. An important component of CBA student assessments is a CBA report card which reports teachers’ assessment of students’ social-emotional and metacognitive abilities. These indicators are reported on the district’s student report cards, or as an addendum to the report card, and are issued at the end of each reporting period along with students’ grades in content areas. This provides students, their parents/guardians and educators with continuous feedback on students’ personal and social-emotional behavior. In addition to individual results, aggregated data can be used to plan what interventions to use and evaluate their impact. There is no substitute for effective front-end planning. A CBA uses a complete planning cycle for school counseling to clearly define expected results, develop action plans capable of achieving the results, and identifying measures that can be used to accurately determine the extent to which the results have been achieved. The complete planning cycle is displayed in the graphic below. Implementing a counseling program requires well-developed plans. A CBA uses four types. Strategic plans are future-oriented and focus on the long-term results the program is expected to achieve and the primary strategies to be used to achieve them. Annual implementation plans are developed prior to beginning of the school year and provide a more detailed scenario of results to be achieved, action steps for each result, and measures that will determine when, and to what extent, the results have been achieved. Counselor-supervisor plans are critical from the perspective of having a unified plan derived from collaboration among counselors and their supervisors. These plans contain agreed upon results for the school year, strategies, action steps and measures. Roles and accountabilities are clearly defined along with a timeline for when specific benchmarks are expected to be achieved. The first three types of plans are all developed from an organizational perspective. The fourth type, planning for personal results, is developed by individual counselors to identify and organize their personal efforts to contribute to the successful achievement of the results specified in the other three plans. All four types of plans should be aligned with the expected results for the school counseling program, and with school and district goals. A CBA must be delivered with fidelity. Delivery requirements should be viewed from two perspectives. First, what needs to be delivered in terms of direct contact with students? Second, it is important to build a reliable infrastructure to support the implementation effort. Essential components of a CBA support infrastructure include clearly-defined roles and accountabilities, documented policies and protocols, substantive and meaningful professional development, and a fluid information system that produces and distributes vital information in a timely fashion to those who need it to make informed decisions about the implementation and future direction of the counseling program. Ongoing evaluation of components of the school counseling program, its activities and interventions, and a periodic in-depth evaluation of the entire program (every 5-7 years) is required. Data must be gathered about the impact of implementing a CBA. Formative assessments and summative evaluations monitor progress in implementing the program by applying continuous improvement principles. Implementation results are analyzed and data are reported and used to make adjustments to the plans and implementation efforts. In addition, school counselor performance evaluation is an important part of the evaluation process as it asks counselors to think about and produce compelling evidence of their proficiency that can be used to improve practice. 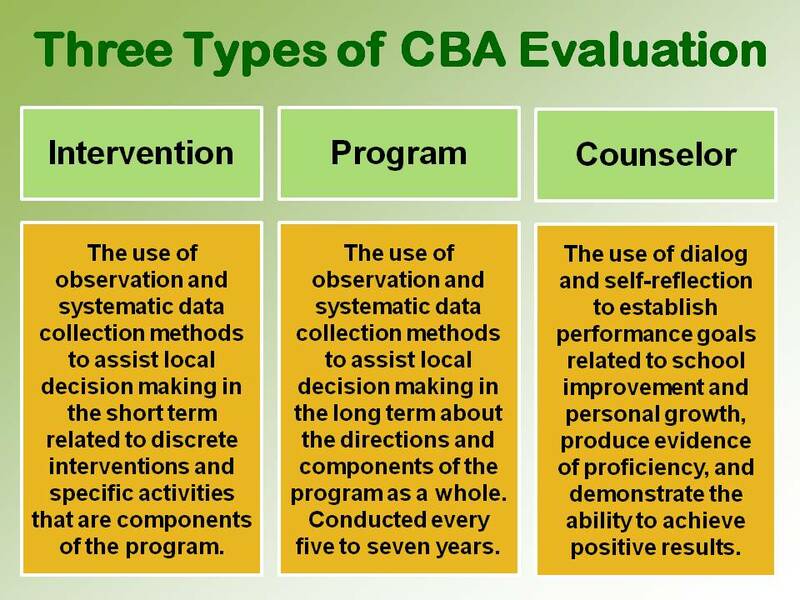 The graphic below illustrates the three primary types of evaluation used in a CBA. 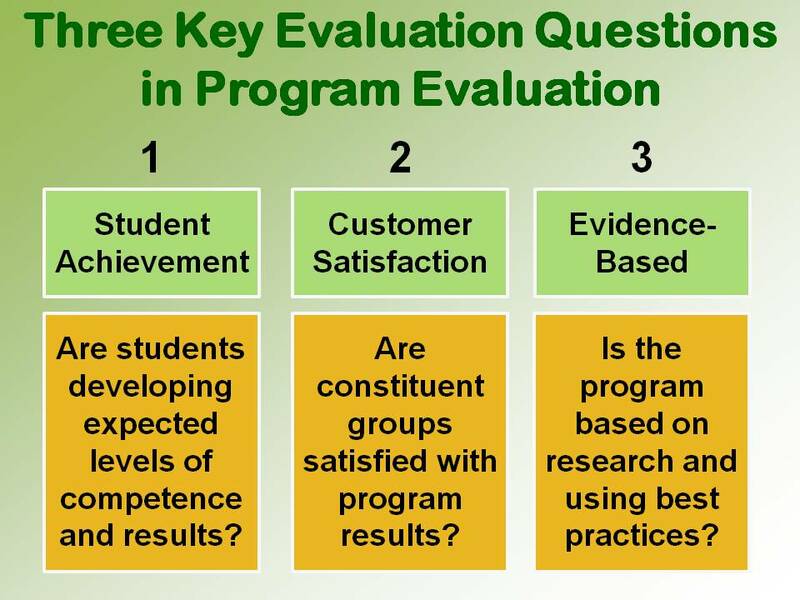 Another way to look at an effective program evaluation process is to identify key questions that need to be answered. We hope this overview has given you a glimpse into the power and potential of a CBA to improve the quality of school counseling programs and counselor practice, and that it inspires you to want to develop and deliver a CBA as part of your current school counseling program. 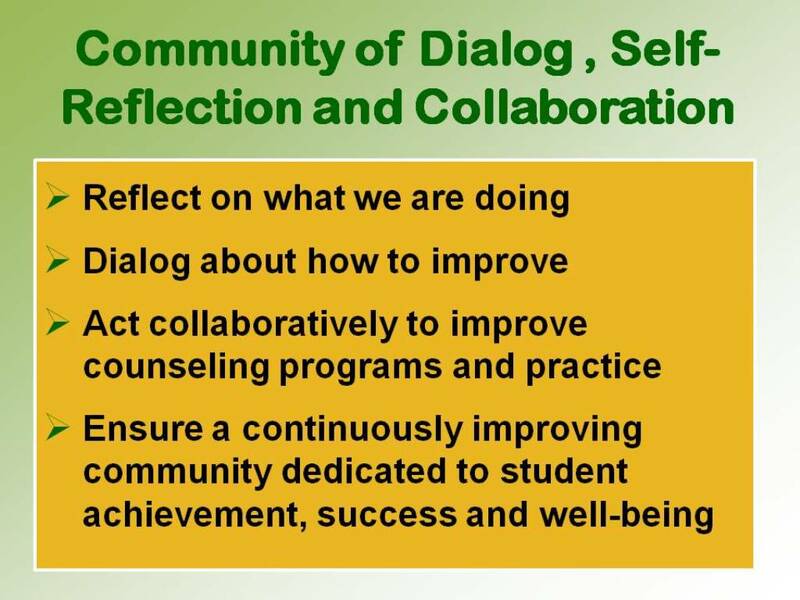 Finally, we want to emphasize two things we feel are essential to the work of school counselors: a community of dialog and self-reflection and accountability. 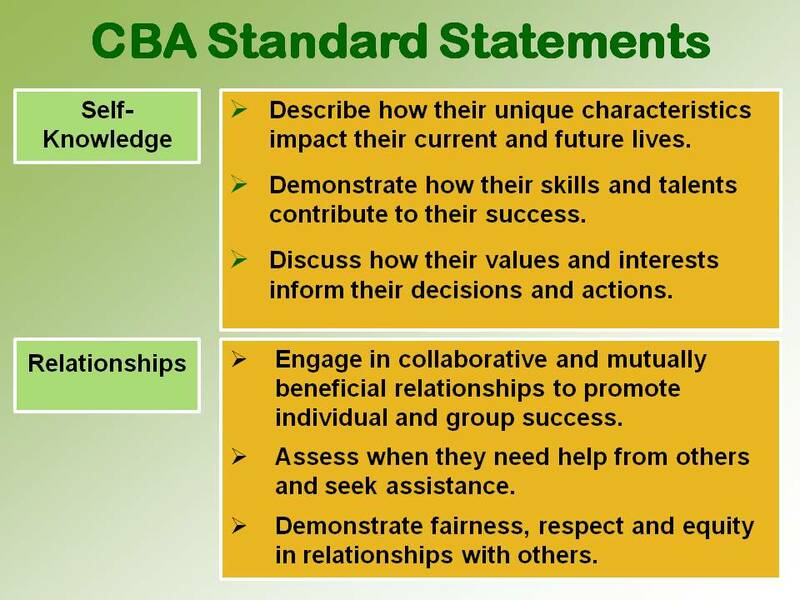 A CBA is most effective when it is developed, delivered and evaluated in a community of dialog, self-reflection, collaboration and shared accountability. We need, both individually and collectively, to reflect on our experience as school counselors to determine how well we are fulfilling our fundamental mission of helping students learn how to learn, plan for their future success and cope with the challenges of growing up and being successful in life. We need to establish a meaningful and ongoing dialog that enables us to accurately identify problems and work collaboratively to solve them. A CBA can be a powerful tool for change that focuses our attention on what matters most and maximizing our potential to be substantive contributors to the lives of the students and families we serve and the school communities of which we are an integral part.